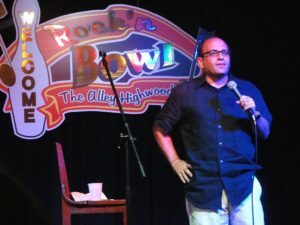 How I suddenly became a stand-up comedian at the age of forty-five is a tale worth the price of admission—which in the case of a blog, is free. I’m asked several times a week how this all came about. So, I figured I’d type it all out and share the story through the tubes of the Interweb. You’ll Laugh. You’ll Cry. And, then you’ll move on with your life! You’ll laugh. You’ll cry. And then you’ll move on with your life. Because, this is my story, not yours. But, maybe the how and why will inspire you. I started my business, ATI Graphics, Inc., in 1997. That’s just short of 20 years. I’ve had many good years, with a couple of tough years, about one per decade. All in all, a pretty good record. The business has been self-sustaining and profitable since the first year. Over the past 19 years, I, and the people that work for and with me have done a lot of good work and helped hundreds of clients with their respective businesses. Honing their brands, their messages and creating effective websites and marketing collateral. 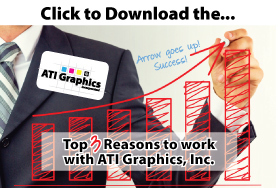 Not to mention advice that guides ATI Graphics, Inc. clients towards better decision making and ultimately, more success. Because, I am a comedian. Have been so for a few years now. And, before I was on stage performing stand-up comedy, I was always writing jokes to integrate into the public speaking that over the years has become a frequent part of my business life. And before that, for as long as I can remember, I was writing jokes that I could strategically inject into conversations at school, parties, work and social events. I’ve always been a comedian, even if I had to deliver the jokes to one or two people at a time throughout an entire evening, instead of to a captive audience of dozens of people. These days, in addition to my day job, I am a professional comedian. People and organizations actually pay me to perform comedy. I even created a new business, Funnier By The Lake Comedy. Many people ask me how and why I started doing stand-up comedy, especially since I was in my forties when I first took that stage. And, for years, since probably college, people have suggested that I should be a stand-up comedian. But, as a fan—or more aptly described, a student—of the art of comedy, I understood that there is a gigantic difference between telling a few topical jokes at parties and getting on stage and PERFORMING ten, twenty, thirty jokes to an audience EXPECTING to laugh. Plus, as a young man, there is absolutely no way. NO. WAY. No way I had the confidence to stand in a spotlight on stage and tell jokes to strangers. I would watch comedians perform and as I got older, more mature and more confident, there was an inkling of a desire to grab that mic. In business, I found myself “performing” for clients, in meetings, to close a deal or get a project. At business events, I would seek out opportunities to emcee the event, lead networking groups, or moderate panel discussions. I found myself writing and practicing jokes, to work out the timing and inflection. At some point, the desire to make a room of hundreds of people laugh became more important. I didn’t realize it at the time but in retrospect, that is when I started to become a “working” comedian of sorts. Truth be told, my wedding in 2005 can be considered my first attempt at stand-up comedy. I spent months writing and rehearsing my speech for the reception. To this day, many guests refer to that speech as the only wedding speech they remember. Between mid 2012 and early 2014, I attended a lot of funerals. It feels like I was going to one each month. Several older relatives, and even some of my friends, contemporaries gone way too early. In the middle of all of that, in May of 2013, my father died. He suddenly became seriously ill and landed in the hospital. And while he recovered amazingly, after about three weeks in the hospital, as happens too often in those places, a secondary infection cropped up and did him in. On Saturday he was alive and kicking. On Sunday he was gone but for the ventilator from which he would be removed just a few days later. A couple of months after the surreal, anxiety-inciting and existential crisis-provoking experience of losing a parent, I learned that a business group of which I was a member was planning a “comedy night” at a local venue. I quickly inquired with the venue owner about serving as emcee of the show. It turned out that the leaders of the group planned to emcee. But then he asked if I would be interested in doing a set. My response was, “Let me think about it.” Though, I really wanted to do it. The death of my father really put me in a “life is short” state of mind. He died so suddenly. He had plans to do things six months later, or the next year. So, when I got back to my office, I clicked over to Facebook and posted that I had tentatively agreed to do a set of stand-up comedy. This was really a passive aggressive way to commit to doing the show. The feedback from that post ranged from “O-M-G!” to “You HAVE TO do it!” At that point, I felt I couldn’t back out. The event was only two weeks out. But, I wrote and rehearsed 15 minutes of original material and on the evening of the show, I took the mic as a stand-up comedian for the first time. There were two other performers that evening. An amateur like myself, and a professional comedian. And. I. Just. Crushed. It. First time as a true stand-up comedian. Honestly, even if I bombed that night, I doubt I would have just given up. Even if only a joke or two landed and received a big laugh, that would have been enough for me to continue. I didn’t immediately jump into performing. It took a bit to find out where I could get on stage, and start meeting other comedians and show runners and finding opportunities. 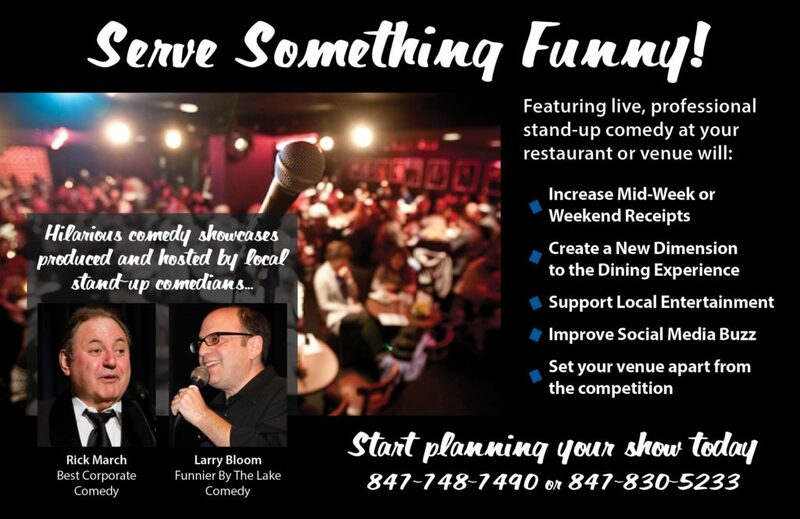 Serve Something Funny brings comedy to restaurants and clubs. While I still keep my day job running ATI Graphics, Inc., as well as manage and facilitate Breakfast Of Champions Networking, I try to take the stage at least once a week, whether for paying gigs or just to work out material. 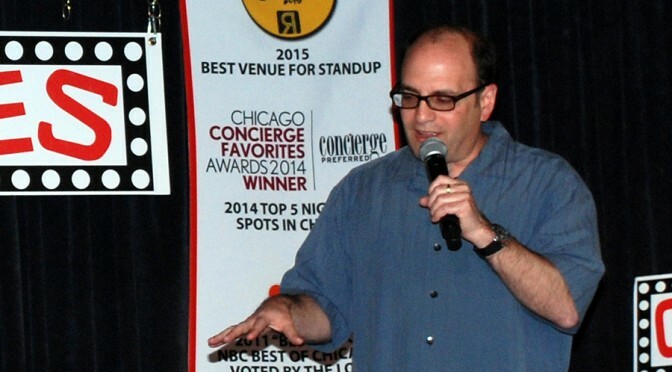 I am also committed to Funnier By The Lake Comedy, through which I am hired to perform at private events, I produce several comedy showcases each month, and work with restaurants, clubs and venues to offer their patrons “dinner-and-a-show” packages. Thank you for coming out. Don’t forget to tip your waitress! Previous PostBuckle Down And Take A Giant, Healthy Quit!Next PostWHO THE EFF HIRED THIS GUY? PINK SLIP YOUR WEBSITE AND MOVE ON!